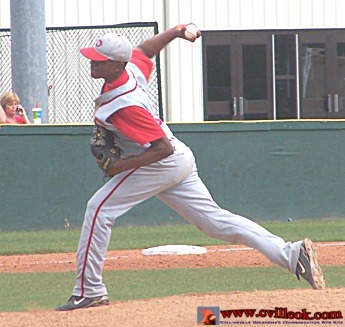 Luis Dejesus (#9) started the 2nd game Wednesday pitching against Shawnee. 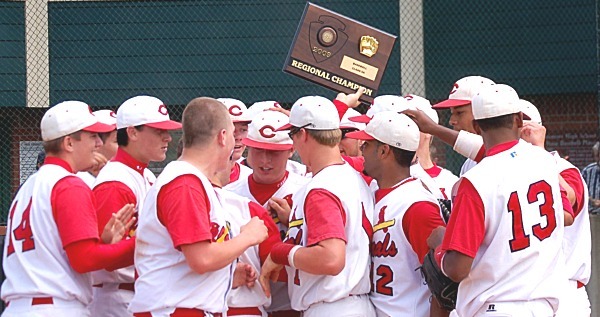 Hope weather cooperates for HS post season play this week (see calendar) -- Ted [Tuesday May 5th regional baseball is a rainout. 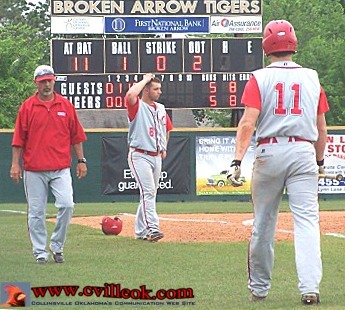 Jose Olazagasti (#12) swings at a Chickasha pitch in the scoreless first inning Wednesday May 13th at Broken's Arrow's baseball diamond with his Collinsville teammates watching from the "home" dugout. 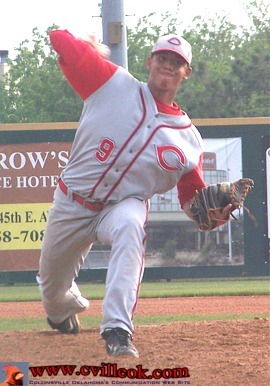 Randy Rogers (#16) started on the mound for Collinsville against Chickasha. 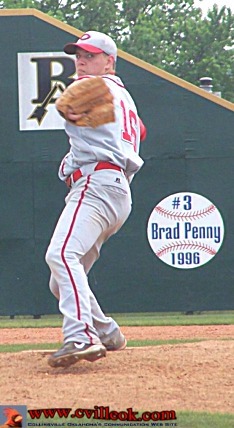 The same Broken Arrow mound was apparently used by major leaguer Brad Penny. 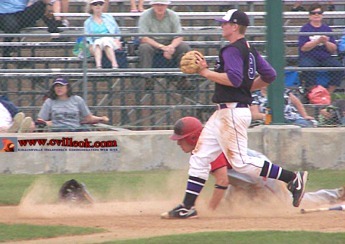 First baseman Bobby Shoate (#8) drifted into foul territory for this 2nd inning Chickasha pop up out. 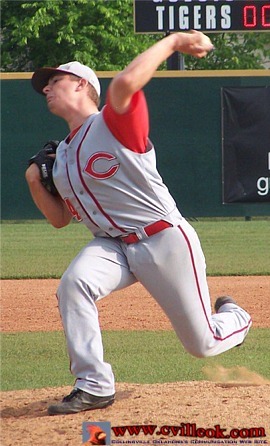 I didn't get a photo but Bobby pulled off a nifty double play in the 3rd snagging a foul line drive and diving to tag 1st base before the runner on first base could tag. This 3rd inning pick off attempt went sour as the Chickasha base runner collided with the Cardinal defender and the ball continued into center field. A hit followed putting Chickasha up by 2 in the 3rd. Second baseman Peter Rodriguez (#13) nearly held on to this high liner but still managed to throw out the runner at first after the ball dropped to end the 3rd inning. 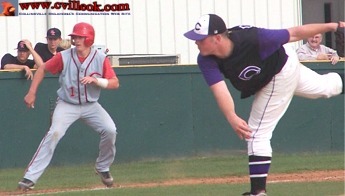 A swinging miss on a 3rd strike proved an effective offensive play several times for both Collinsville and Chickasha. 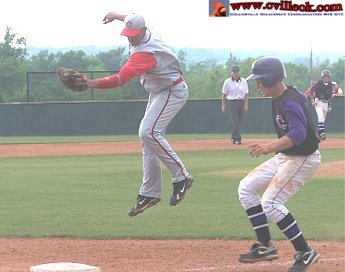 Collinsville scored their first run in the 4th inning (above) with Riley Murr sliding home safely after what would have been a Rodriguez strikeout got past the catcher. Lane Coulter scored on the next play on a Nick Goza double to even the score at 2-2. 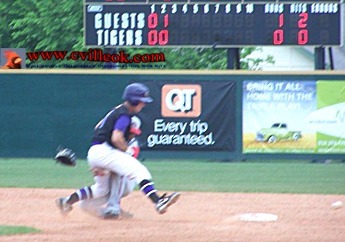 Chickasha had the bases loaded and no outs to start the 4th. Randy Rogers got one strikeout and Peter Rodriguez (#13) came in to pitch for another 2 strikeouts to keep the Cards close at 0-2. Peter Rodriguez repeated the swinging 3rd stike miss getting away from the catcher in the 5th inning scoring Lane Coulter to bring the score to 4-5. A Nick Goza RBI single then tied the game at 5-5. Chickasha made one of their pitching changes after Collinsville evened the game in the 5th with 2 outs and the bases still loaded. 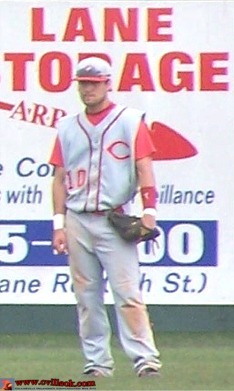 Bobby Shoate (#8) was on 3rd base as Coach Tony Reeder approached Trevor Rabbitt (#11) with advise. 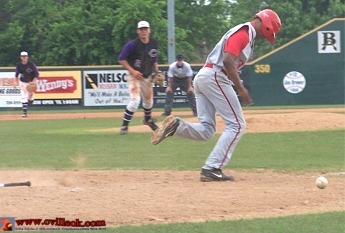 Rabbitt hit a liner to center but Chickasha fielded to stop the Cardinal rally. 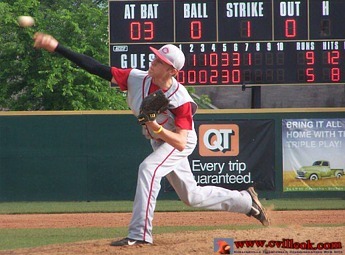 Brock Werdell (#4) pitched the 6th inning with Chickasha picking up 3 unanswered runs. 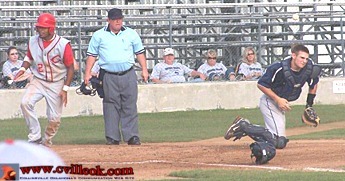 Luis Dejesus (#9) went high to save this throw from second base but the runner got back to 3rd safely in the 6th inning. Joe Keith (#1) running for Jordan Pasquale (who had reached 1st on a dropped 3rd strike) reached 3rd base in the 6th inning but was left stranded. 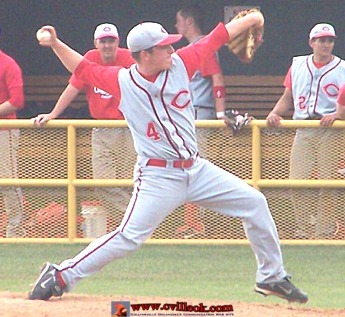 Channing Newland (#17 above) started the 7th for the Cards but gave up the final 2 Chickasha runs before Matt Lister (#14 below) came in for the 2 final outs. Collinsville loaded the bases in their half of the 7th (on singles by Shoate, Rogers & Dejesus) but couldn't plate a run losing 5-10 setting up the 2nd game about 30 minutes later. 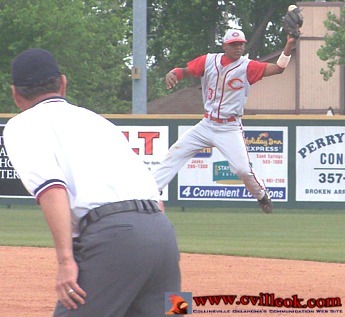 I cound not attend the Thursday game with Bishop Kelly eliminating Collinsville 4-9 .. leaving Chickasha and BK to decide the 5A title. 5/15 Tulsa World Coverage of Bishop Kelley loss 4-9 (& Elimination). Cards finished first 5A season at 25-11.